TRIVIA of Noh : Q68 : What is the basic tone in Noh music? | Home | Trivia | Q68 : What is the basic tone in Noh music? What is the basic tone in Noh music? A Noh performance is made up of musical elements that include the playing of musical instruments and chanting. But there is no basic tone for the performances of the three percussion instruments (small and large tabors and a drum) and flute. For the flute, which is an instrument of melody, each individual instrument has a different tone and melody. It is chanting that produces the basic tone on stage. Because the tone of the chanting is based on the natural voices of the reciters, as well as the principal, it varies depending on the performers and occasion, unlike tone in the absolute scale of Western music. 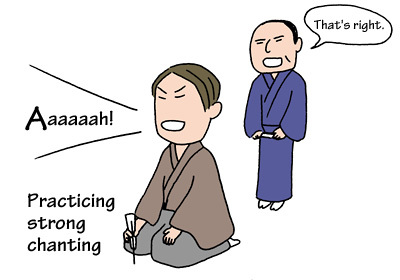 There are two types of chanting in modern Noh theatre, yowa-gin (weak chanting) and tsuyo-gin (strong chanting). Yowa-gin is also called jū-gin (soft chanting). Based on melodious singing with three different tones (high, middle and low), this is considered the original Noh chanting. As described above, Western vocal music is sung with basic tones based on an absolute scale, while Noh performers chant with their own tones based on relative scales that depend on the occasion. Tsuyo-gin is also called gō-gin (hard chanting). It is believed to have been established between the late Edo and the Meiji eras. Tsuyo-gin is distinguished by strong breathing and soulful chanting. When yowa-gin and tsuyo-gin are combined, performers are able to bring to the stage with skill and delicacy expressions of pathos, bravery, grace, astonishment and gallantry.